LIGHT TOWER RENTAL maximize uptime on your frac or construction site. A well lit job site 24 hours a day, seven days a week. When time is money, it's not an option...it's a necessity! 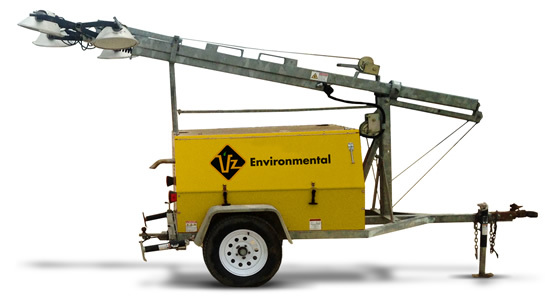 VZ Environmental is a provider of light tower rentals to the oil, gas and construction industries. Our fleet of 8kW and 20kW vertical mast portable trailer towers are available for rental for a day, week or longer. Our rental options are designed to best suit the needs of our customers. Choose a location below nearest you for contact information. Call us for a quote or use our online contact form. 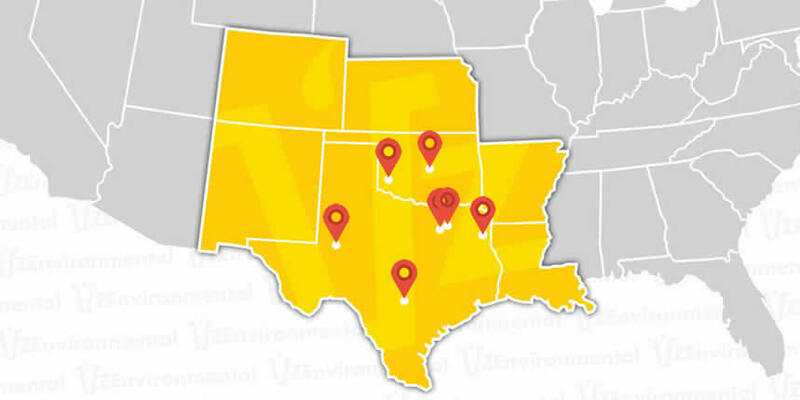 VZ Environmental has strategic office and fully staffed oilfield service yard locations to efficiently service customers in Arkansas, Colorado, Kansas, Louisiana, New Mexico, Oklahoma and Texas. 8kW and 20kW light tower trailer rentals available for one or more days. VZ Environmental's goal is to maintain a zero Total Recordable Incident Rate (TRIR). The safety or our workers and others at the sites we service is fundamental. Our Safety Director, Gerald Forrest, maintains on-going safety training and certification for all oilfield services employees and VZ Environmental is rated with all major safety rating companies. This includes Avetta, ComplyWorks, DISA Global Solutions, ISNetworld, PEC Safety and SafeLand USA. VZ Environmental's commitment to quality is recognized within the Oil and Gas industry. "Excellence in Health and Safety Products" award. "Specialty Industry Supplier of the Year" award. Cover article in Gas, Oil & Mining Contractor. Featured article in Fort Worth Business Press. Panel Speaker on "Leadership Ideas in the Oil & Gas Industry". Portable light towers provide the means to "Ensure adequate lighting to perform tasks." as outlined in OSHA 3763-12. Worker safety is key and adequate lighting while working at night can help protect workers from slips, trips, and falls by providing quality illumination for a large area. They can also improve security, especially if your job site is in a remote or isolated area. Portable light towers have easy set-up and mobility allowing for workers to conveniently adjust or move the lights to where they are needed. Their compact size provides maximum power in a minimal footprint. As an option to the rental rate, you can contract with VZ Environmental to maintain the fuel and move the units as needed or do it yourself. Light towers are an essential part of maximizing uptime on your frac or construction site and easily allow for great return on your investment. As such, renting a light tower ensures the flexibility needed to allow uninterrupted execution of services at your site no matter what time of day or night. Our rental inventory of light towers is meticulously maintained by experienced personnel to maximize safety, efficiency and reliability on your site.